Hi guys! I can't believe it's Wednesday, and this 3-day weekend can't come fast enough. I don't have any plans besides rest up and catch up on some swatching. My husband and I are making our way through Parks & Rec, so we'll likely do a little binging of that on Netflix. 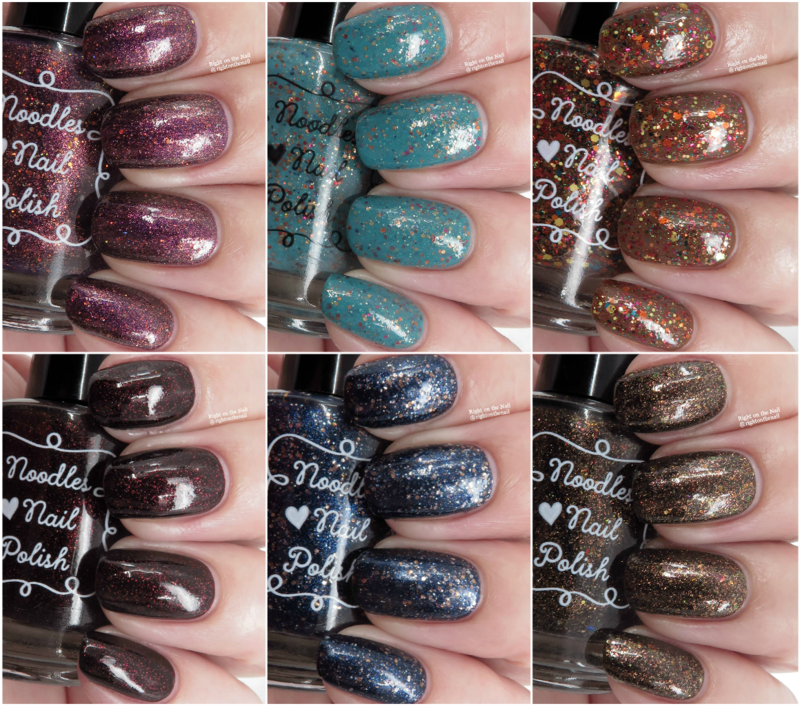 Tonight I have a very special collection to share to you from Noodles Nail Polish. 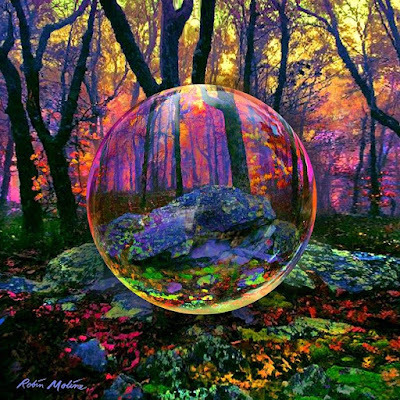 Fall is Natalie's favorite season, so she really pulls out all the stops here. The 6-piece set has 3 jellies, 2 glitter crellies, and a glitter topcoat that can also be used on its own. All polishes will be sold individually for $9.50 each with a release date of Sept.1st (yep, this Saturday) at noon EST. 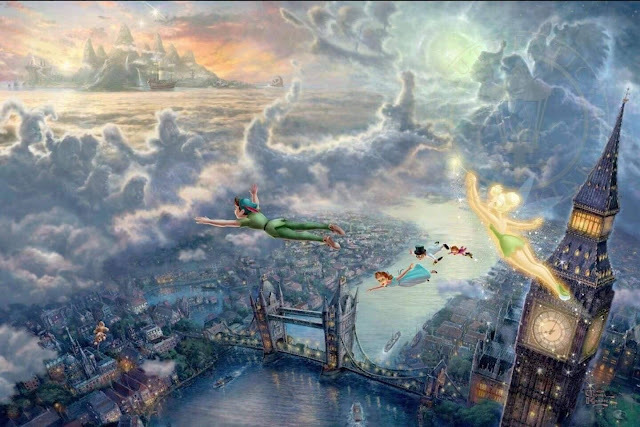 This post is extremely picture heavy, so we should get right into the reviews. Hi guys! I spent the weekend working in San Francisco and just got back Monday morning. I'm always amazed how cool the weather is there in the summer. I didn't see much other than the hotel, but I still had a good time. The September PPU is upon us, and this month the theme is horror movies. I actually like the horror genre, but my husband very much doesn't. That means that most of the movies I see are watched while I'm traveling. Tonight I have Noodles Nail Polish's contribution which is inspired by the 1984 movie Gremlins. I was only 2 when it came out, but I definitely watched it while I was younger and loved it. I mean, just look at how cute Gizmo is! This one is called Never Feed Him After Midnight and it will be available at 11 AM ET on Sept 7th through 11:59 PM ET Sept. 10th. It will retail for $11.50 a bottle with a cap of 200 bottles. 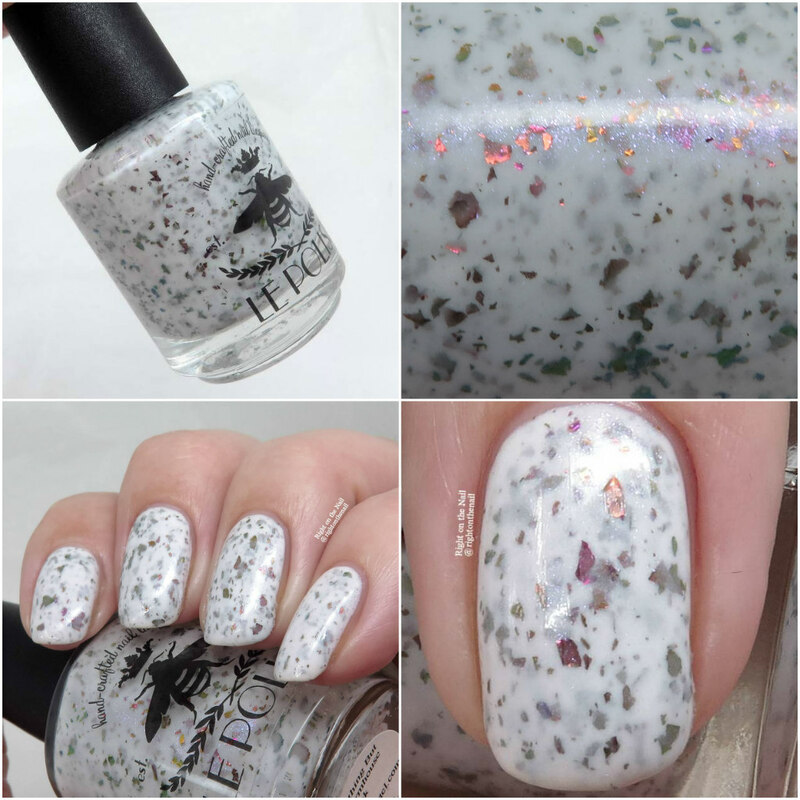 Never Feed Him After Midnight is a medium brown creme base with copper holo glitter, copper shimmer, and white and copper flakes with a scattered holographic finish. I'm really loving the white flakes in this one! The formula was just right, needing just 2 thin coats for full opacity. It dried quickly and had minimal texture, even with the small copper glitter. Even though this is horror inspired, it feels like a fall polish, and I'm 100% ok with that. It was 93 degrees F in NC today, so I'm hoping for a little fall weather soon. 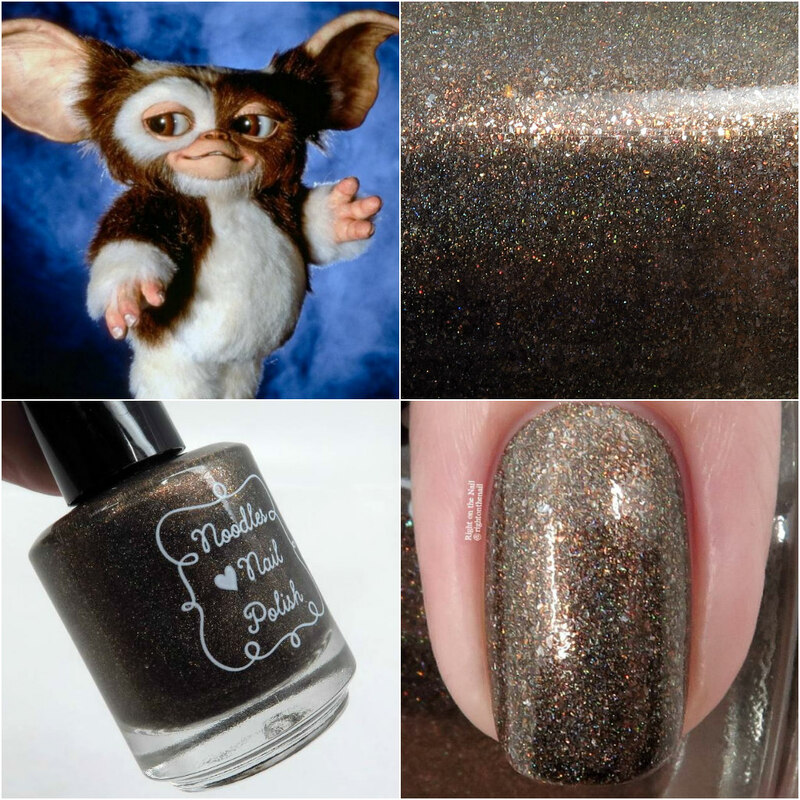 It just so happens this polish perfectly matches Gizmo's fur, too. Again, this one will be available for $11.50 at 11 AM on Sept. 7th with a cap of 200 bottles. 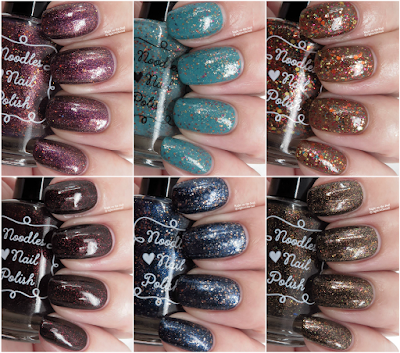 If you're a fall polish lover, brown polish lover, holo lover, or 80s movie lover, this one is for you. You can find out more about Noodles Nail Polish on their website, Instagram page, Facebook page, and Facebook Fan Group while you can learn more about the Polish Pickup on their Facebook page and website. Hi guys! I've been super busy with work, but I just wanted to do a quick review of an Emily de Molly color. I've been sitting on these swatches for a few months, and I have no idea why it's taken me so long to show these. I believe these were also taken with my old camera. I don't know if you guys noticed or not, but I got a new camera earlier this year. I've been super happy with the results, and I hope you are, too. This is the first time I'm showing Emily de Molly on the blog, but I've gone back and made a few purchases because I've been so impressed with the complexity of their polishes. They're an Australian brand, but don't worry, they have a U.S. distribution shipping center so you won't be paying that outrageous international shipping. Remember the candy Now and Later? I have a love/hate relationship with them because I like that they last a long time, but I always want to chew it before it's soft enough. Didn't know you were here for candy reviews, huh? Now and Later the polish is a bright neon pink that verges on coral, with small hexagonal silver glitter, and a gold shimmer finish. Emily de Molly has extremely interesting color combinations and often combines different finishes to really make them different than other indies. I used 2 coats for the swatches above, and I had no issues with the formula. I bought this one on sale for only $6, and it's still available! It's totally worth it, and do yourself a favor and pick yourself up a couple extra while you're there...you deserve it. You can find out more about Emily de Molly on their US/international website, AU website, Facebook, Instagram, or Twitter pages. I was recently asked by Keny Nicole to do a little comparison of Zoya's Tina and Delia. I know that comparison posts are important and interesting, but they always fall by the wayside. If you can think of any polishes that need a little comparison, please comment or send me a message. Tina comes from the Spring 2017 Charming Collection while Delia was featured in the Summer 2018 Sunshine Collection. Both of them are medium purple cremes that are very similar. Nope, they aren't dupes, but it's up to you whether you need both. Tina has more pink in it while Delia has more blue in it. Delia has a dustiness that Tina doesn't have, either. I know these aren't nail swatches, but I thought the swatch sticks would help. I used 2 coats + topcoat for both of the colors above, and they both applied well. Hi guys! I'm trying to force myself back into some normalcy. The week has been flying by and I'm not complaining at all. Tonight I have a new brand on the blog, le Polish. I've seen Alison's work around, especially in PPU, but it wasn't until I saw photos of the polish I'm showing tonight to fully convince me to purchase some. I've got some bad news though...le Polish is closed until September, so if you're interested in purchasing this one, you will have to wait a few weeks. As far as I know, this trio isn't going anywhere. Everything But the Farmhouse Sink is a white crelly base with loads of UCC flakes and purple shimmer. SO.MANY.FLAKIES! My photos aren't the best at showing it, but the purple shimmer is quite apparent in real life. I had no issues with the formula, and I used 3 thin coats for my photos. You could easily load up the brush a bit more and use 2 coats. The flakes laid flat on the nail, and it dried with just a little bit of texture. I love this one, and I 100% recommend it. If you aren't a huge flakie fan, this one may not be for you. This one isn't available right now, but check back in September. It retails for $11 and you can purchase it individually or with the others in the Fixer Upper trio. You can find out more about le Polish on their website, Instagram, Facebook page, and Facebook Fan Group. Hi guys! I hope you had a relaxing weekend, I know did. It's been raining like crazy here. Some of the thunderstorms have been pretty intense, too. Tonight I have a polish from Pahlish I got during their Bastille Day celebration a few weeks ago. The one I'm showing was a special mystery polish, and I couldn't be happier with it, despite not choosing it myself. Right now Pahlish is having their Summer Clearance sale, so check to see if any of your favorites are available. There's a little bit of everything, including some Christmas in July colors. The Mystery Overstock polishes are still available for just $7.00 and may contain discontinued, LE, Bastille Day mystery samples, For the Love of Polish box polishes, or Polish Pickup polishes. I've bought many mystery polishes from Pahlish, and I've never been disappointed...especially for only $7! The color I received is Amelie and it's a deep metallic cranberry red with gold flakes. It was extremely pigmented and applied easily in just 2 coats. It dried with minimal texture, but it needed a little extra scrubbing to remove due to the flakes. Shannon does an amazing job at these metallic flakie and foil polishes. For example, Team Zissou and Quicksand are both available for just $6 right now. Remember, there's no guarantee that you'll get Amelie if you get a Mystery Pahlish, but I'm sure you'll love what you get. Find out more about Pahlish on their website, Instagram, and Facebook pages.